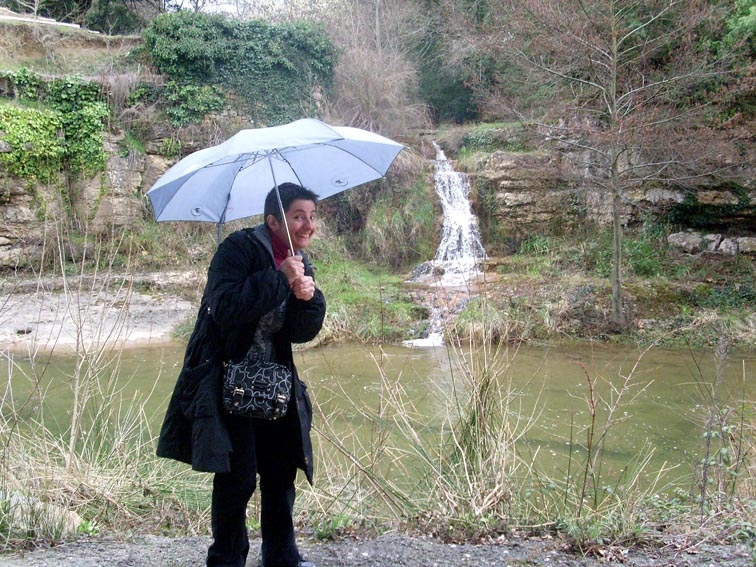 I called my book "The Sacred River of Rennes-les-Bains" because I was drawn to the town as a result of researching Mary Magdalene, because so many people had been telling me she had lived at Rennes-le-Chateau, but I didn't believe it; in the first century BC the village didn't exist. (To find the book, click here.) 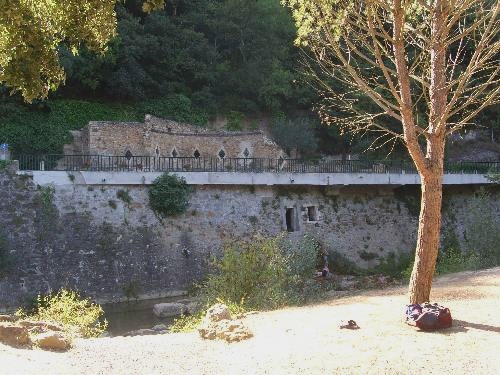 But it is accepted by many now that Mary Magdalene converted people at Rennes-les-Bains and baptised them in the river, mainly the most beautiful "Fontaine des Amours" or Lover's Fountain. Find it by driving about 2km south of Rennes-les-Bains, and then turn left over the bridge towards Sougraine. 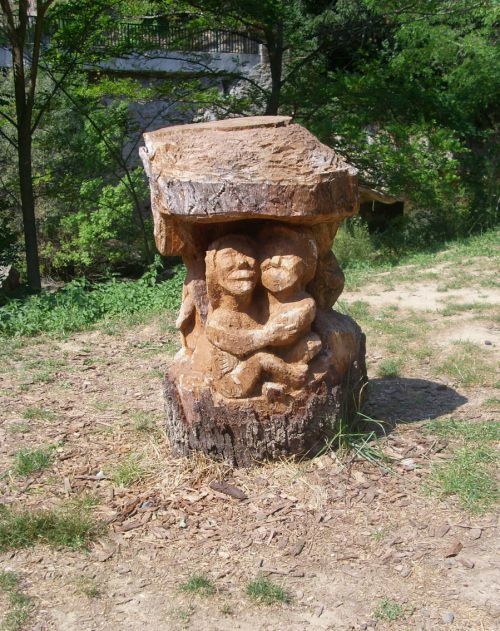 After 1.3 kilometres you find the Lover's Fountain. It's says that if you bathe together there, or share your vows there, then your love will never die. 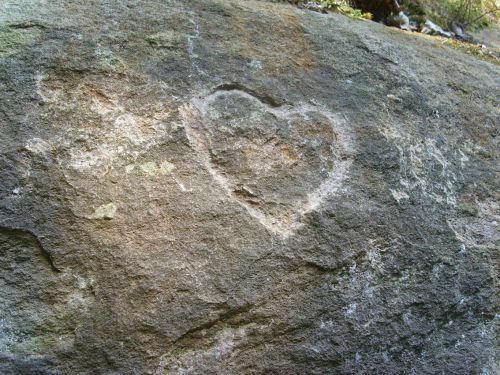 It signifies a pure and undeniable love, almost religious in its nature, and so many people go there to meditate or experience the sacredness of the site. You see the deep green pool and to the left of it, the flat rock? 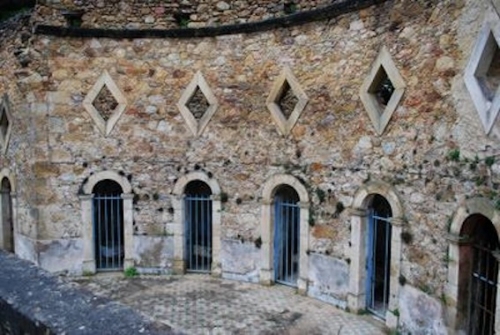 This is important because I am convinced that this was where Mary Magdalene baptised people during her stay at Rennes-les-Bains, or Aquae Calidae - warm waters - in those Roman days. It's a perfect place because baptism was by whole body immersion, and the priestess, and the friends of the new adherent, could stand there during the baptism. After the ceremony, the priestess and other others embraced the naked and wet initiate to welcome him or her to a new life, where sins were forgotten, and everyone was welcome in a loving community. (The early Christians shared all goods in common.) I believe they did whole body baptisms as the Mandeans do today. 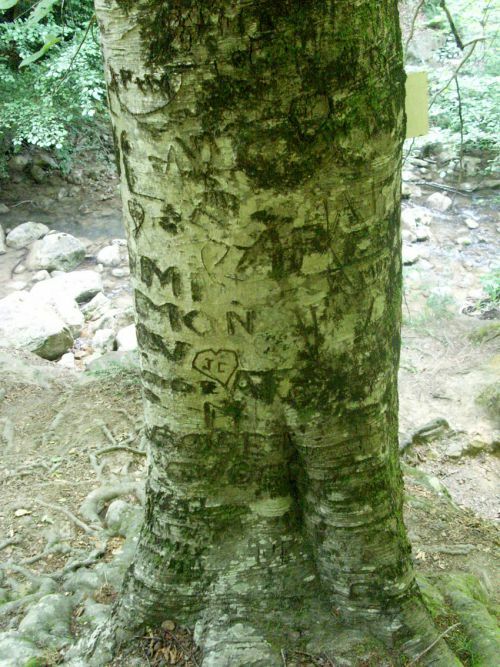 It doesn't take too great a leap of faith to imagine that this sort of sacred love and friendship is what people still find today at this beautiful place, and this is how it got its name. I met two people there called, unbelievably, Joshua and Maria, and they re-enacted a baptism for my camera. The spot is not that easy to find, being invisible from the road. Drive from the Benitier on the Sougraine road, cross the tiny bridge just after a right hand bend, and a couple of hundred metres further on, you will see two low walls on the right. Park after the second one and then look for a path descending down to the river through the trees. I visited with friends in August 2012 and the boys wisely declined to swim - the water was very very cold and very deep! So please take care at this spot. However, from the point of view of early Christian baptism, you might like to know that John the Baptist thought, the colder the water the better; another scrap of evidence for this being a chosen place . . .
And a place for love indeed. The heart, they say, represents Mary Magdalene . . . There is another place where it's thought Mary Magdalene baptised people, just further downstream where the Sals meets La Blanque. It is called the Benitier by the local people, although it is not named on the map. The word Benitier means - baptismal font. 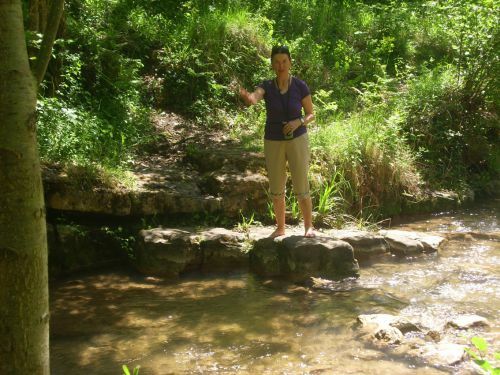 Before then the river flows smoothly and you can get down easily to the water's edge. It's so peaceful and magic. 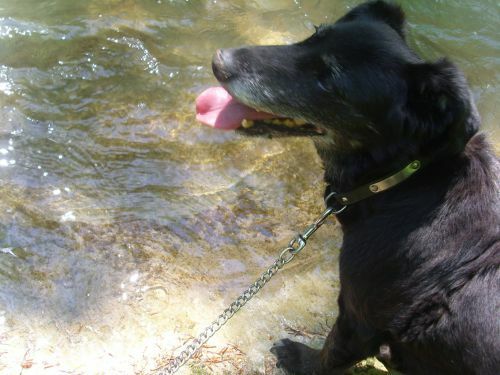 Gabi, being an adventurous soul, immediately discarded her sandals and waded into the water. 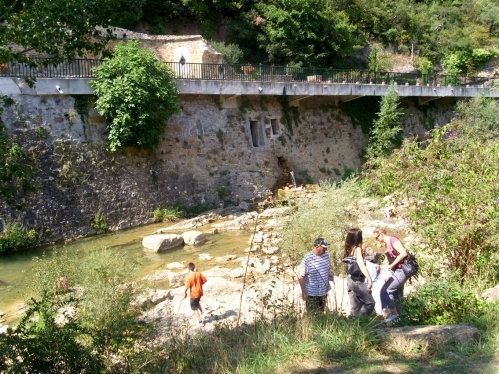 Then, the Benitier is the place where two rivers meet; the Sals coming down past the Fontaine des Amours from its source just past Sougraine village, and the River Blanque coming from the south. 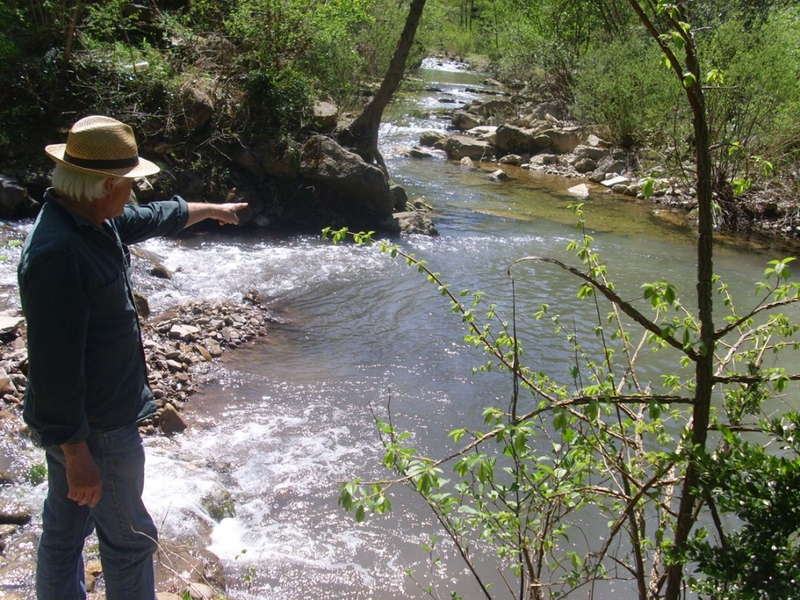 You can see that the Sals (coming from the left) meeting the Blanque has made a pool after thousands of years of the water swirling at this junction. 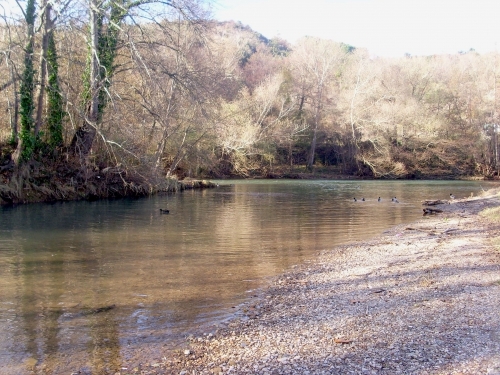 The River Blanque used to arise from a place further south, less than a kilometre past Bugarach, but this valley has now been made into a lake called Lac de la Vène. 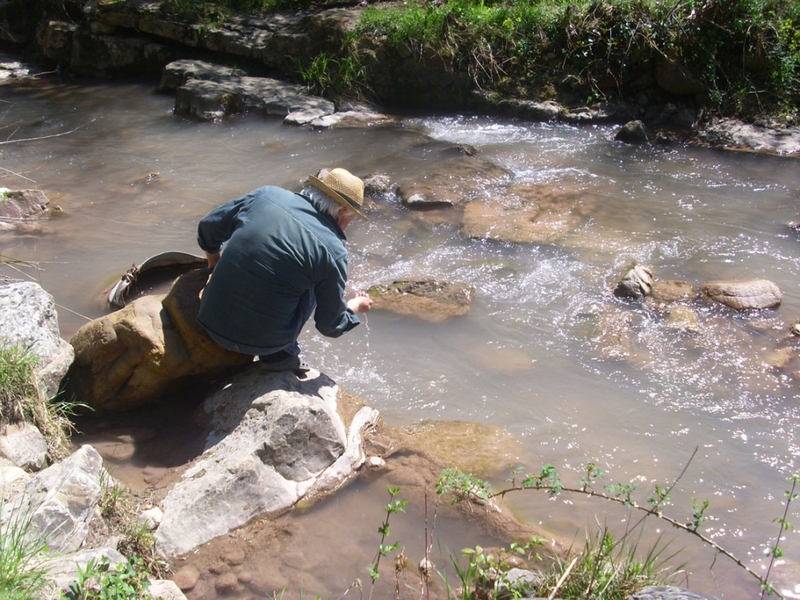 But the tiny brook called La Blanque still feeds it, and still flows out of it towards Rennes-les-Bains. 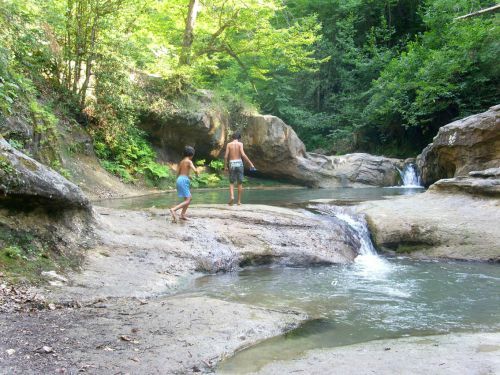 Further upsteam is the Cascades des Matthieux, marked on the map. People bathe there but do keep an eye on your children. 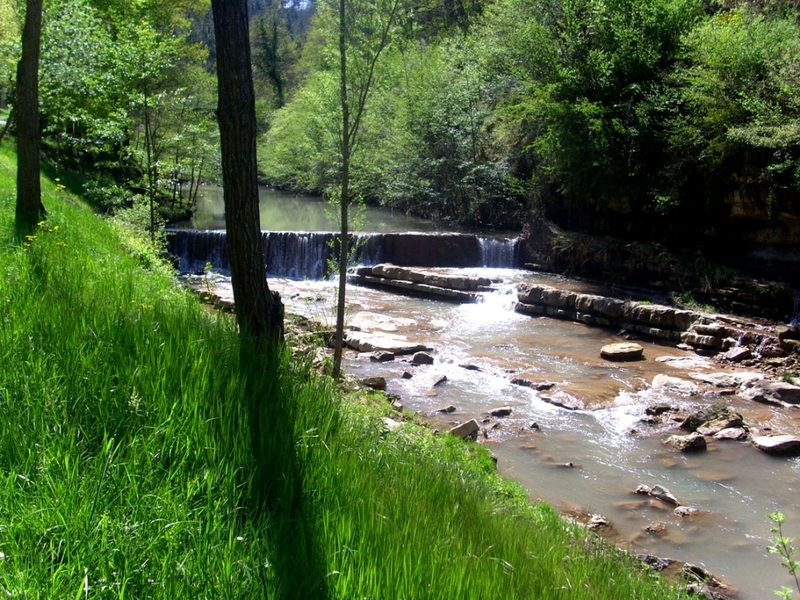 Meanwhile, between Bugarach and Rennes-les-Bains beside the river Blanque is a place called Source de la Madeleine, just 300 metres before the Benitier. 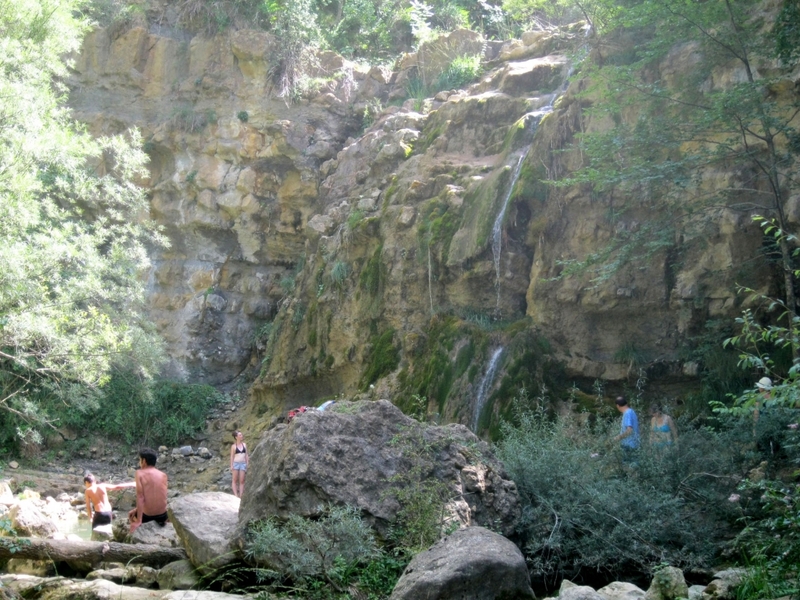 Many people have speculated that this was where Mary Magdalene baptised people. But when I investigated, that was not possible. In Jewish times (and Mary and Jesus lived in Jewish times when all the known world was the Roman Empire) baptism was by whole body immersion, which would not be possible at the Source de la Madeleine. The river Blanque is very low, there are no deep pools, and the natural source water (not part of the river at all) trickles without enthusiasm out of a crack in the rocks. 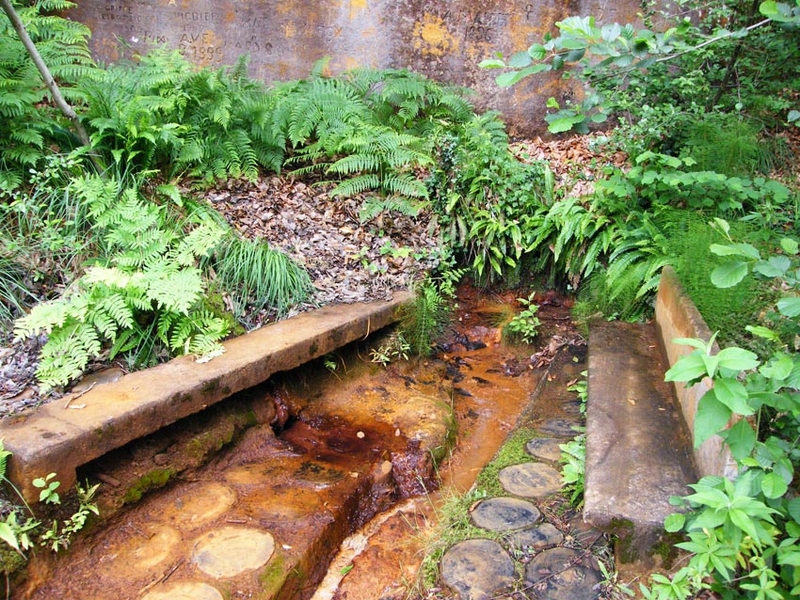 You can see the remains of benches where people sat to fill their bottles with the source water. So why was it named after the Magdalene? It wasn't. It was named after a local lady who used to visit it most days, called Madeleine; a common first name in France. 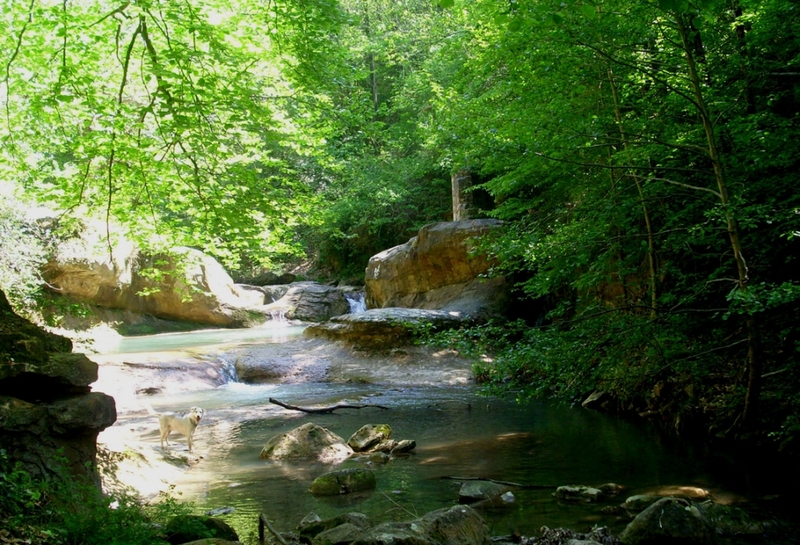 Before that is was called the Source de la Gode, "gode" being an ancient Occitan or Celtic word meaning "Cup." The well known Henri Boudet wrote about this in his book, "La Vrai Langue Celtique" which was published in 1886. Before the villages had municipal water, the people collected their water from the natural sources. 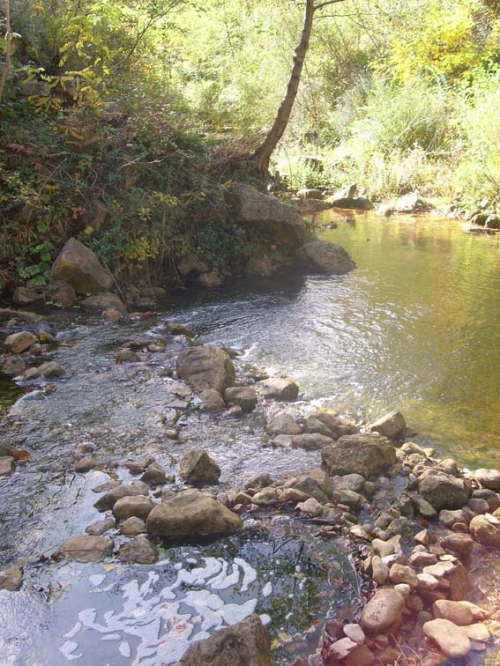 Because the Sacred River Sals is salty (which signified cleanliness in Mary Magdalene's time) it has an entirely different origin to that of the Blanque. 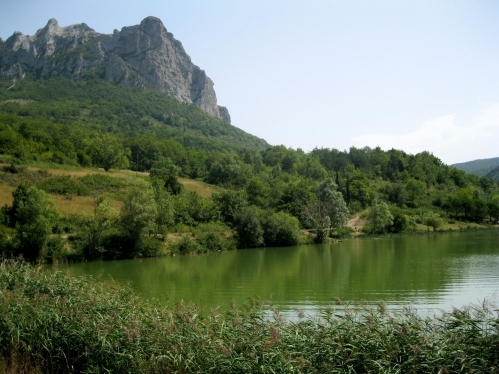 Geologists have traced that the underground water below the mountain of Bugarach ran over salt deposits before springing from the ground as the River Sals. 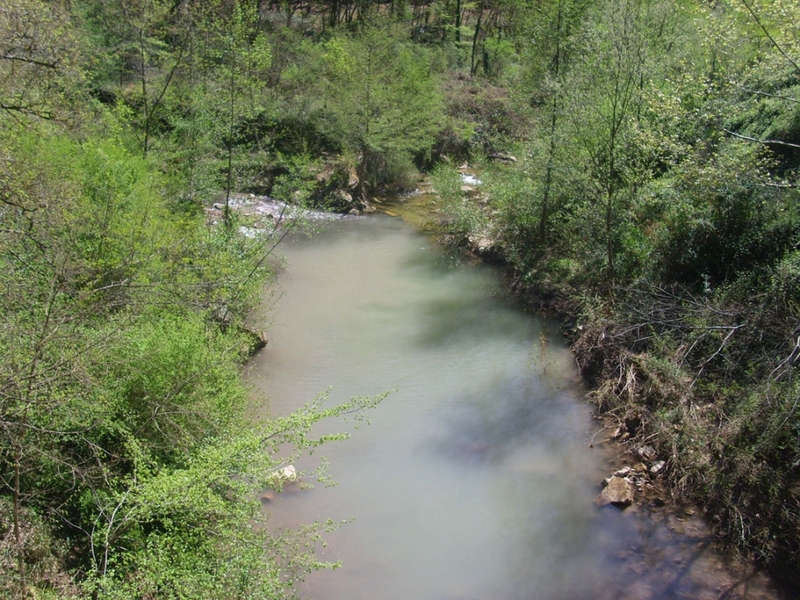 But the river varies every day due to various factors, and sometimes it looks milky. This was taken from the bridge near the Benitier. But it is possible to get down to the river for a closer look, and yes, it tastes salty, but not like salt as we know it, my friend told me. 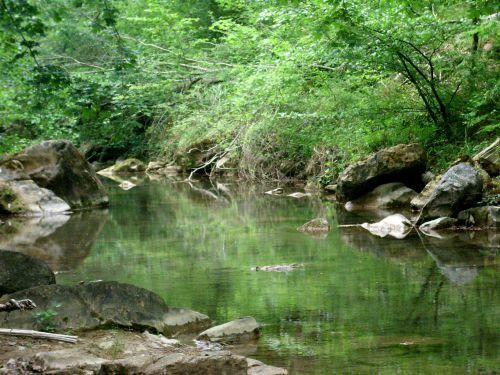 Further along the river passes behind today's camping, but if you turn left at the Benitier bridge you will find a delightful picnic spot, with a view of a natural waterfall in the river. It then continues through the centre of the town, as you will see in our article here. 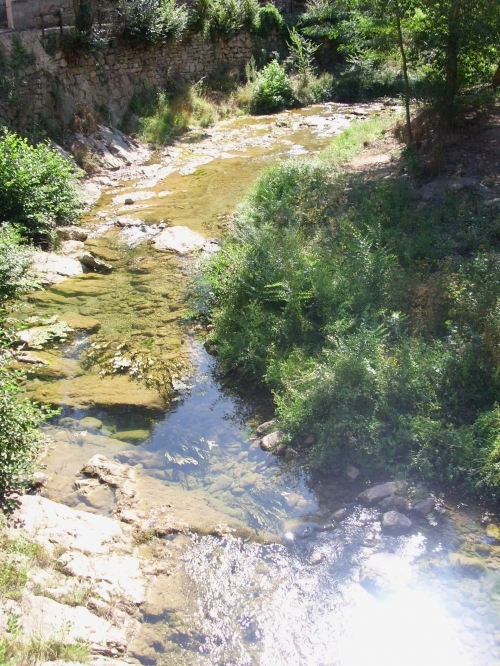 On a summer's day, especially if it has been hot, the river meanders low and slow as in the first picture below; but it has never dried up, being continually fed by its source at Sougraigne. 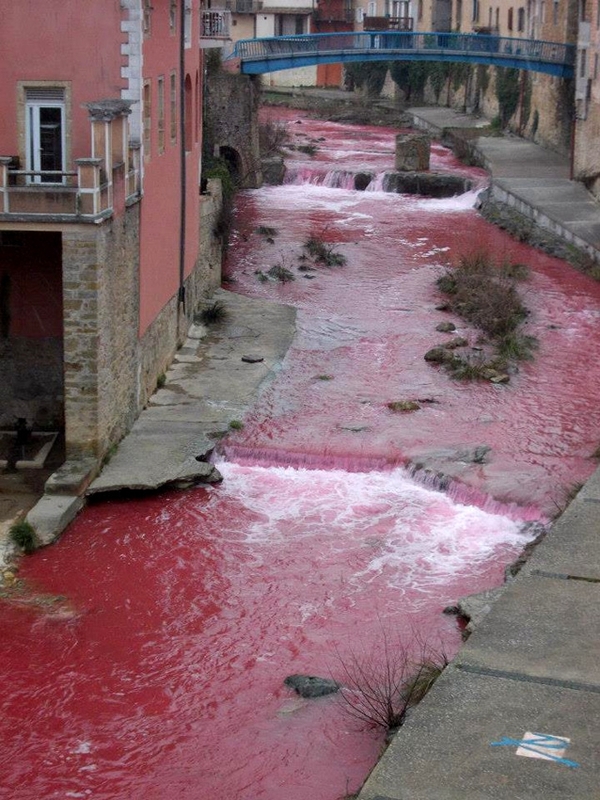 All the world was shocked one day when the river suddenly turned red like blood! Apparently scientists were doing some sort of experiment underneath Bugarach and had added dye to the water. But the level does rise or fall according to the weather and other factors. 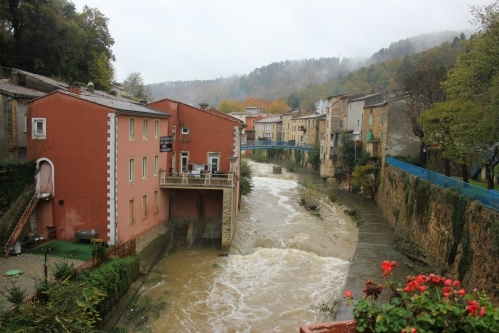 In November 2013 it was cold and rainy and the water level rose considerably, nearly covering the pavements either side and inundating the bath under the "Pink Hotel." The stone sculptures have been swept away. The local people laugh off their worries. "Oh, we've known much worse than this!" they say, thinking of a major flood in 1992. 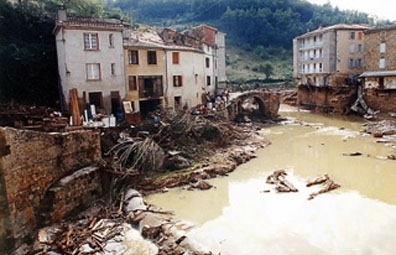 In September 1992 in Rennes-les-Bains, the water rose a fantastic 15 metres, the highest ever recorded. The villagers went to the highest rooms in their houses, watching in horror as whole caravans from the camp-site went racing along on the crazy waters. Torn-up trees banged against their walls. It lasted four hours and three people died. 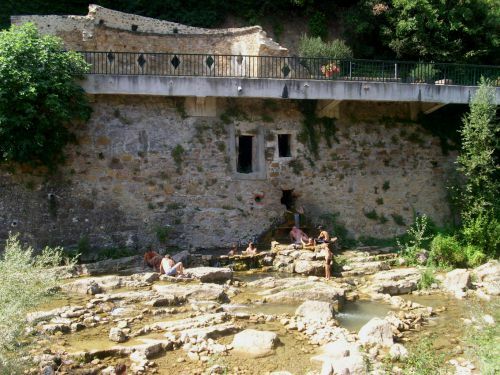 The swimming pool of the Bains de la Reine was swept away to reveal Roman remains of a mosaic bath and all the cemetery ornaments disappeared in the torrent. They were later found on the beach at Narbonne plage - for the Sals joins the Aude at Couiza - and Couiza also suffered badly. 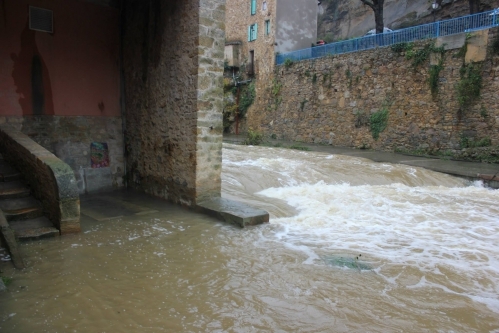 The department of Aude declared an emergency and work began the next day to restore the village and its shattered economy. They were faced with a mammoth task; but all was done by April 1993, ready for the holiday season. When entering the village from the north, one sees the building with the lozenge-shaped windows on the right. Many call these the Roman Baths, because the design of the building seems Roman somehow, but in fact the building is 17th century at the earliest. And then it was called, "The Bath of the Lepers!" 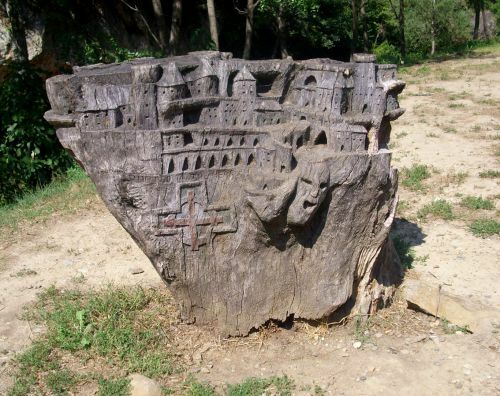 This was because, at the time, the disease psoriasis, which is vastly eased by this mineral water, was thought to be leprosy, and there was a "leper colony" at Bézu, and the people came to take the waters here. 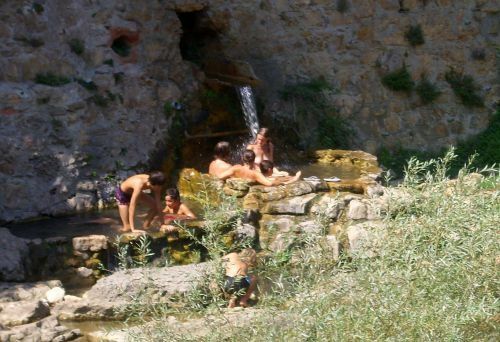 The building has been closed for a long time, as it was too costly to renovate it to twentieth century standards, but the warm water was diverted and now flows from a pipe in the wall under the baths into the river Sals. Naturally, bathers love it. To find this delightful spot, drive into the town from the north, and park in the official parking. 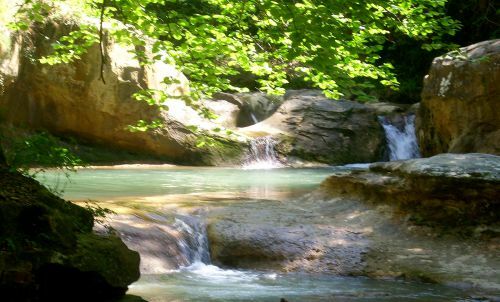 Take the path past the Bains de la Reine, with its turquoise swimming pool, down to the river. Cross to the eastern bank. After about 200 metres, you come to a place where the warm waters of the natural spring are diverted directly into the river. 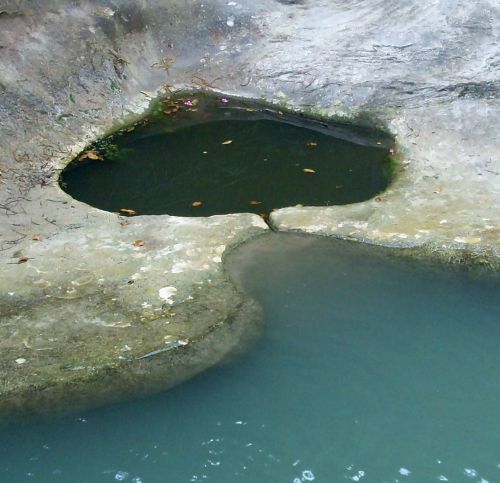 Pools have been made among the rocks by the bathers themselves. 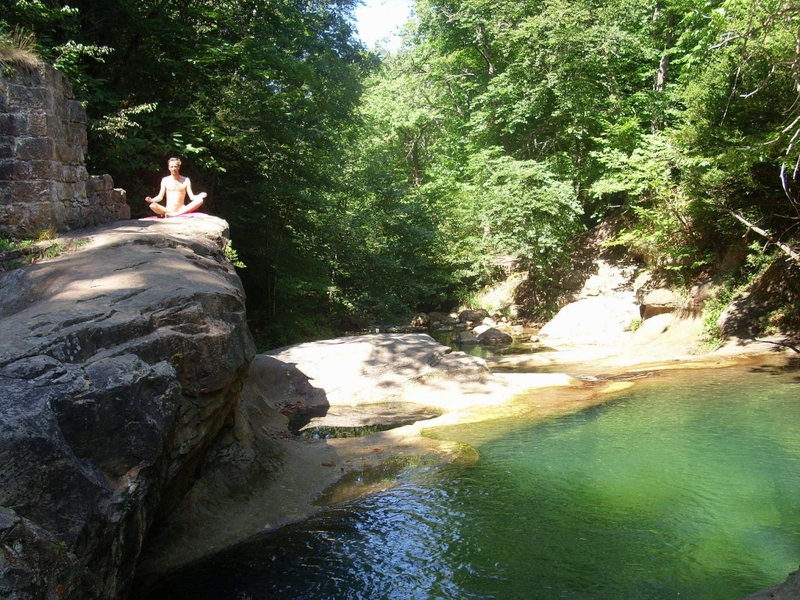 I recently visited with friends Corinnne and Jocelyn, my friend Corinne wanted to take a dip in the Bains de la Reine. The day was warm, and as the water in the swimming pool was 32 degrees, and the sun was shining, it was a hot experience! But she said she felt very relaxed afterwards. Meanwhile. 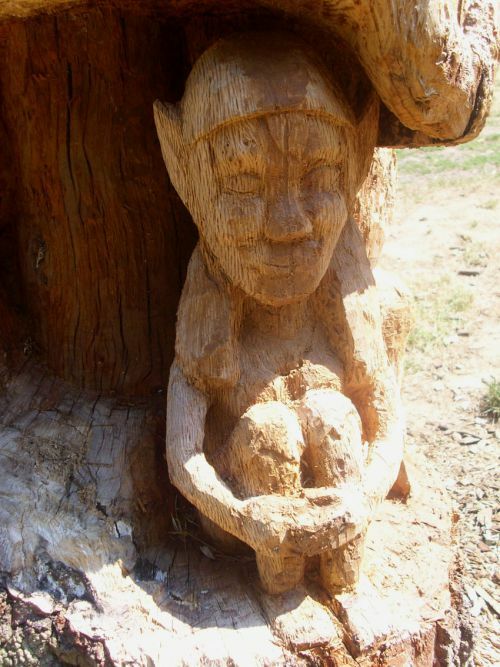 Jocelyn and I had a picnic lunch opposite the old baths.By the picnic spot are some carvings out of wood which have been fascinating people for several years now . 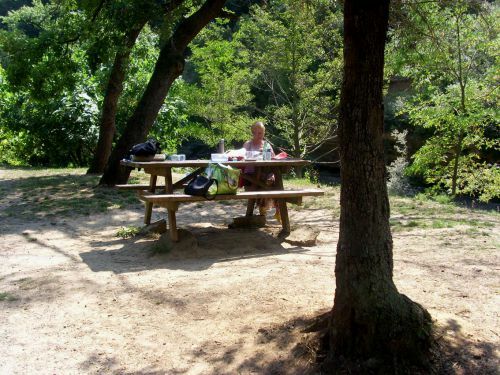 . .
Picnic tables are provided under the trees. We met some southern Irish people there. There's a very friendly atmosphere in Rennes-les-Bains, everyone talks to everyone. After Rennes-les-Bains the river continues northwards and is joined by the River Rialsesse at La Mourette, before turning left for Couiza. 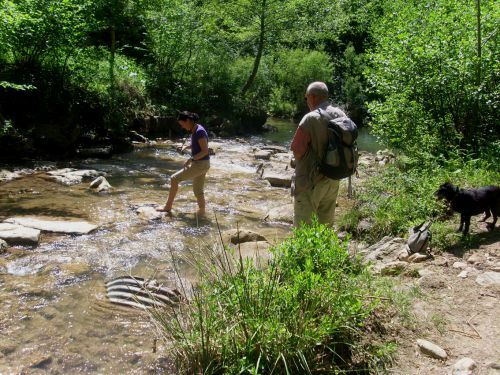 After five kilometres it "throws itself", as the French like saying, into the River Aude. 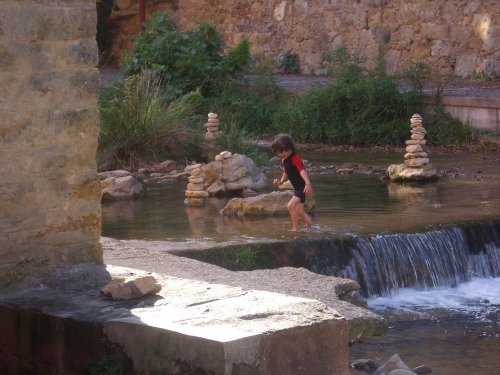 This junction is a beautiful spot, you can walk to it along a custom build pathway, with the old town of Couiza on the left and the Joyeuse castle on the right. So peaceful, the spot where the Sals, the "sacred river" meets the mighty Aude.